Our comprehensive Professional Real Estate Assistant Training & Certification Programs are geared to both in-house and virtual service providers and is applicable to real estate in the United States and Canada. The Professional Real Estate Assistant training applies to the U.S. and Canadian Markets. Practical hands-on training that can be immediately applied to working with real estate professionals. Get instant access and discover if real estate assistance is right for you. YES – I WANT TO KNOW. GIVE ME THE REPORT! Used to be back in the day, realtors only used in-house assistants for the myriad of tasks they needed help with. But the Internet changed all that. For several years now, assistants in this profession have had the exciting flexibility of working virtually from their homes or elsewhere, delivering the same excellent service as they would at the 9-to-5 realty office. Brokers and agents alike are working with REVAs because they’ve realized the benefits and outstanding value of outsourcing. They are handing off their marketing and administrative tasks to free up their time to work on income-generating activities, including prospecting, listing and selling. They are partnering with REVAs to take care of such tasks as listing coordination, contact management, lead generation, and transaction management. Don’t worry. That doesn’t leave in-house Real Estate Assistants out in the cold. These professionals are still a huge asset to realtors, as they always have been. In fact, it really doesn’t matter where an assistant works from. What matters is what they know. Our Professional Real Estate Assistant Certification Program is geared to both types of service provider and is the only one of its kind in the industry. Pam Ivey, creator and lead instructor, scoured the typical brick and mortar as well as Internet training offerings and found them wanting. So she created what she couldn’t find; a course packed with the right kind of information that today’s REAs need to really step into the role of skilled and strategic realtor’s right-hand. Your value as a Certified Professional Real Estate Assistant just quadrupled. Top producers work at top-speed. And Real Estate Assistants MUST be able to pick up the ball and run with it. The good news is, it doesn’t matter if you’re new to the industry or you’re a veteran, you’ll learn what you need to know to knowledgeably and confidently support real estate selling professionals in using the latest systems and software in all major areas – everything from the basics to niche services that you can learn to help you better assist your agents and make you a “hot commodity” in the real estate industry. This program provides students with the PRACTICAL information and HANDS-ON training that can be immediately applied to working with real estate professionals. As I became close to finishing a virtual assistant certification program, I began thinking about focusing on a niche market. Through research, I came across the Professional Real Estate Assistant Certification program. It appeared to cover many of the aspects to become a proficient real estate assistant. I was not disappointed! This program gives you the tools to be a successful real estate assistant and the best part is that it applies to both the U.S. and Canadian markets. Another big plus is that assignments and exams are marked quickly and returned with helpful and supportive comments. This program gives you the basics and then goes beyond to help you think outside the box as you support real estate professionals. Because I had already been an office manager/assistant in real estate for 20 years, I knew that it was time for me to start my own home-based business. Since my office had mainly done things the old-fashioned way (manually), updating my skills was a must. I had already taken Pam Ivey’s VA Blueprint course but wanted to focus on my ideal client, so I jumped into REA University. The information in each module was detailed and was supported by audio interviews and forms. Most important to me was the confidence I felt from being able to practice online with some of the top real estate software that I could access through REA University. It was exactly what I needed. My recommendation is to take the challenge that will launch your new career. You will develop in-depth knowledge of the industry and the services you can offer. Thank you Pam, for using your experience to inspire others. Sign on the dotted line… er… click, “Get Access Now!” and DON’T LOOK BACK! If you’re serious about wanting to excel in the real estate industry and provide an amazing, profitable service to real estate professionals, and be GREAT at it, than this is the program for you. The knowledge in each module is simply invaluable. Tack on the fact that it is being provided by such a renowned, professional and respected trainer and coach in the real estate industry, and you’ve got yourself a winning combination. I have definitely found the program a big help on grasping the basics of the industry and providing direction of what tools and resources that are available for the different aspects of real estate agent support. Having gone through the program, I definitely feel much better prepared and feel like I can have an intelligent conversation with a real estate professional regarding their needs and how I can help. Thank you for providing such a great and informative program Pam! Who Invests in the Professional Real Estate Assistant Certification program? Those with Zero Experience but a great interest and passion in real estate. Experienced Folks who have worked in the industry and want to up-level their skills and Get Certified. 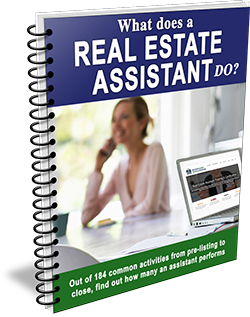 Real Estate Professionals who want their assistants to be trained in effective and efficient real estate support techniques. I found your course (Transaction Coordination) to be very informative. I did learn a lot. I am currently waiting to take my test for the California Real Estate License exam. I am being proactive and trying to learn as much as I can before I get my license, so I can get started right away. Your course gave me a much better understanding of the steps it takes to close in a transaction. I also learned what I need to look for when it’s time to hire my own assistant!